A heavy duty all purpose tacker, fitted with a wire-guide attachment for stapling small diameter cables. 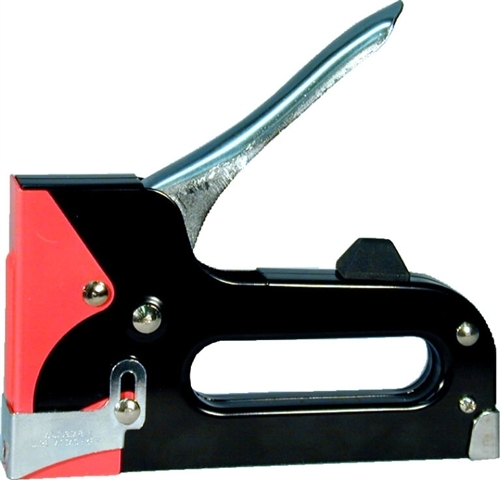 The UNIQUE FEATURE of this tacker is that it uses a wide range of commonly available American staples, including Markwell L3 Series, Arrow T50 (A-11) Series, DuoFast 50 Series, BeA 95, Senco D and heavy duty staples from Sears, Master Mechanic and similar, in sizes from ¼” through 9/16”. An outstanding all-purpose do-it-yourself tacker that is not staple-specific. Copyright © Markwell Mfg Co Inc. All Rights Reserved.